World Candidates 2013-14: It’s Carlsen! Preview: This is it! It is now a one-round tournament with both Magnus Carlsen and Vladimir Kramnik vying for the right to face World Champion Viswanathan Anand in November. 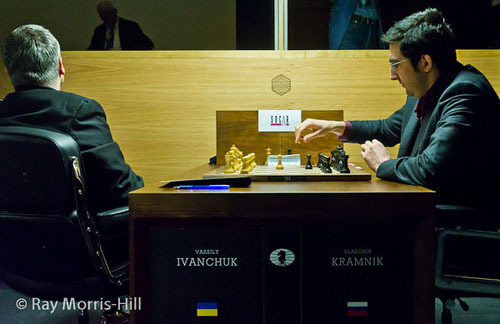 For Kramnik, it would amount to a rematch. For Carlsen, it would be an opportunity for ascendancy to the top for world chess. Carlsen will face Peter Svidler who is actually in top form despite losing to Carlsen earlier. Kramnik will play an erratic Vassily Ivanchuk who is very capable of beating Kramnik despite losing five games on time! It should be a very tense. The two other games… probably uneventful draws. Overview: In what ended as one of the most thrilling tournaments in years the 2013 Candidates tournament was an epic event in what has become a vindication of the entire cycle… however imperfect it is. There were several leaders with Carlsen, then Aronian, then Kramnik. The last round, there were two players vying for the chance to challenge for the World Championship against Viswanathan Anand in November. The tournament result was in doubt all the way until the last pawn was push. What happened to #4-ranked Teimour Radjabov??? Before we get to the marquee matchups let’s discuss the two others. Levon Aronian ended the tournament on a strong note after fumbling the lead in the second half of the tournament. His last win was at the expense of a shellshocked Teimour Radjabov who lost seven games… perhaps twice the amount he loses in one year. It may have been a combination of his brief hiatus, preparation for his new life of marriage and lack of prep time for the biggest tournament of his life. He did not manage well and chess is an unforgiving sport. Aronian’s powerful 34.Ree7! weaved a mating net around the black king while the black pieces looked on helplessly. In this game, Aronian unfurled the Averbakh Variation against Radjabov’s favorite King’s Indian Defense. He was able to get a very fluid position and sacrificed the e4-pawn for initiative. This initiative turned into a tactical melee which ended with Aronian sacrificing his queen for two rooks. 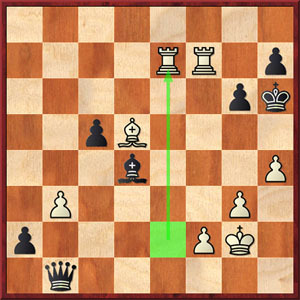 These two rooks begin a dastardly plan of weaving a nice net around the king starting with 31.Bd5! a2 32.Rxf7+ Kg5 33.h4+ Kh6 34.Ree7! (diagram) Black is helpless after 34…g5 35.Be4! since 35…Qxe4+ 36. Rxe4 Kg6 (36… a1=Q 37. Re6+ Kh5 38. g4+! Kxg4 39. f3+ Kxh4 (39… Kh5 40. Rxh7#) 40. Rh6#)) 37. Ra7 a1=Q 38. Rxa1 Bxa1 39. hxg5 Kxg5 40. Rc4+-. Nice combination by the Armenian who ended on a solid +2 along with Svidler. Carlsen-Svidler and Ivanchuk-Kramnik were the marquee matchups for today and they were epic indeed. In Carlsen-Svidler, tension was in the air as they traversed through the Ruy Lopez. There was a critical moment and there was tension so thick you could cut it with a knife. Carlsen was also running low on time and one could feel that he was coming apart. A scintillating attack roared ahead after 31…Nf4! Svidler mopped up after that but his compatriot failed to hold Ivanchuk. Russians will be shut out of the championship cycle once again. Svidler threw down 31…Nf4! attempting to batter the door down with an all-out onslaught. Carlsen accepted the offer and his position was soon being overrun after 32. gxf4 Qxh4 33. Nxf7 Bxf3! Carlsen had to try simplifying. This resulted in a completely losing ending where Svidler’s two bishops were swarming the board and supporting the rolling pawns. Carlsen resigned and left the fate in the last game of the tournament. So… with the chess world in shock, the Ivanchuk-Kramnik would determine who would be the challenger. It is not clear if Kramnik knew that Carlsen lost, but he was already in mortal danger against Ivanchuk. Kramnik unwisely chose the Pirc Defense which does not have a following at the elite level. Not sure why Kramnik played this other than to catch Ivanchuk sleeping. When Vassily Ivanchuk looks away as he was shown doing against Magnus Carlsen, it is cause to beware. However,Vladimir Kramnik may have made a poor choice in the Pirc Defense. Photo by Ray Morris-Hill. Ivanchuk played the classical setup with 1.d4 d6 2.e4 Nf6 3.Nc3 g6 4.Nf3 Bg7 5.Be2. White got a comfortable game and began to gain a bind on the position after a nice pawn sac with 24.g3!? Nxh3+ 25.Kg2 Nhg5 26.Rh1. Before the game, he intimated that this was “just another game” and quelled all talk of collusion as he tightened the screws on Kramnik. This is not the kind of position that suits Kramnik. Usually he is on the end squeezing with positional pressure. He missed his best chance with 35…Rxa6! 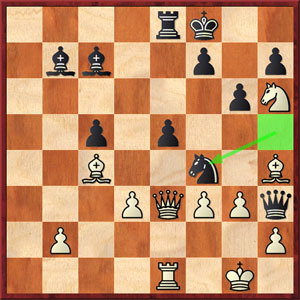 and instead landed in hot water with the decisive mistake 35…Rc8? After Ivanchuk established a powerful passed pawn with 38.b5! Rb7 39.b6 c5 40.Rb1 Bf8 41.Qd5 and black was helpless. Ivanchuk wrapped up the full point when after 47.Kf1, black is in zugzwang. Wow!!! If anyone had predicted that both Carlsen and Kramnik would lose they would have beat all the odds-makers. 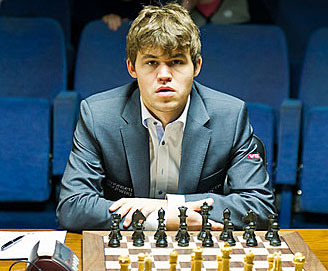 Nevertheless, Carlsen limped through to earn a chance at the championship title. His second half was unimpressive to say the least… losing twice (Ivanchuk and Svidler) and getting worse positions in two other games (Radjabov and Kramnik). He will most certainly have to sharpen his openings against the well-prepared team of Anand. However, a new era of chess has begun and Carlsen will be more than a worthy challenger. Magnus Carlsen, World Championship Challenger! The Russian era of chess appears to be officially over. The rise of China and India and players from non-chess nations (such as Norway) are upon us. The tools are available these days. Just the matchup I wanted to see, Carlsen vs Anand. This should make for an interesting slugfest. Magnus Carlsen discusses thrilling game with Peter Svidler. Vladimir Kramnik discusses thought process during game with Vassily Ivanchuk. This may be a good example of having a lack of focus in a crucial game. It was hard for Kramnik to totally ignore the Carlsen-Svidler game, but it became a distraction. Who do you see winning the match in November? What can Carlsen do to beat Anand? I’ll give Anand the edge because of match experience. There is absolutely no way Carlsen can compensate for this shortcoming. He will improve his opening play, but it will interesting to see how Carlsen handles the intimate psychological pressure of a match. Carlsen certainly looks beatable right now. But November is a long ways away. Unbeatable??? I wouldn’t say that. 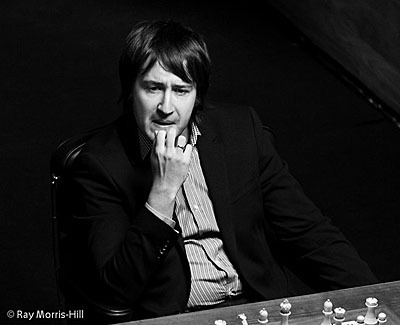 He lost to both Ivanchuk and Svidler (badly), was busted against both Radjabov and Kramnik. However, he is very resilient and will be a tough opponent. Championship matches are not merely about talent. The psychological factor is a great part of it as we have seen in so many matches. Having to deal with the relentless pressure of facing the same opponent can be daunting to someone who has never done it before. Carlsen seems to get rattled when he’s on a bad stretch. I’m sure he will work on these deficiencies from within his camp. Much of this tournament was a series of near-misses by his opponents. Yes… you’re right. I’m not sure how much he prepared for this, but I know he was in good physical shape and that may have saved him. We’ll see. I would not take Anand’s chances against Carlsen too lightly. There’s a reason why he’s been holding the title for this long. He is at his optimum in match play. He has demonstrated that he is also quite at ease at handling intense pressure. However, having said that, I do believe that because of Carlsen’s other attributes and remarkable chess aptitude, this match will undoubtedly help re-energized the interest in chess worldwide.